Form follows ingenuity for young South African industrial designers Marc Nicolson and Lyall Sprong of the year-old studio Thingking. They work with just a handful of tools; their designs are about what they can source and make themselves. A suburb of Cape Town, Khayelitsha is the largest and fastest-growing semi-formal township in South Africa. Home to more than half a million residents, it offers few lifelines out of an endless sea of single-story corrugated iron shacks. 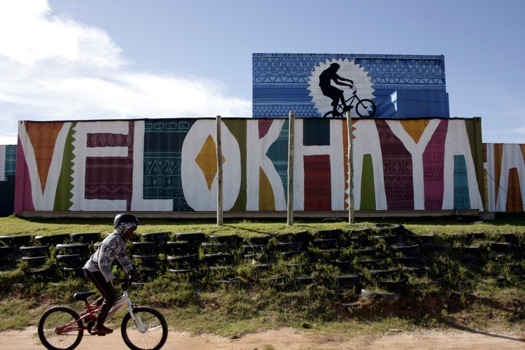 Nicolson is there to upgrade the clubhouse of the Velokhaya community road cycling and BMX hub, one of the area’s few escapes. Nicolson and Sprong have known each other since studying industrial design together some five years ago. They were inspired to start a company when they realized they shared a belief that design is about “thinking” and “things” — the origin of their name. 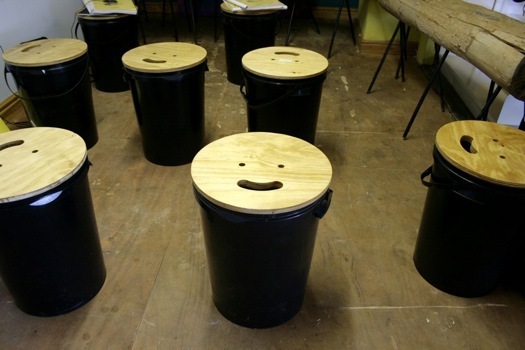 Although Velokhaya is their first social design client, they hope it will lead to more. Handed the conservative budget of ZAR50,000 ($7,268) by Safmarine, Thingking began by covering one of the building’s walls with a giant mural brandishing big bold letters contrasted with brightly colored Afrocentric patterns. The mural was designed by Spanish street artists Boa Mistura, who were in Cape Town on a residency. Boa Mistura and Thingking executed the painting over two days in March with about 40 community volunteers. When Nicolson and Sprong returned a week later, they discovered that the Velokhaya team had painted the entire clubhouse inside and out. On their next visit, they found that the taps had been fixed. Then they returned to a patched roof. “There was a massive change in terms of the ownership, the pride and the empowerment that happened through us just being here and implementing things,” Nicolson says. Thingking next focused on upgrading the clubhouse to better support cyclists while also creating a community space. The firm supervised the design and construction of barbecue grills known as barrel braais for large community events. A gas-catering unit was purchased to compensate for the township’s lack of electricity. Cheap seating was made by adding re-used steel legs to eucalyptus logs to create three-person benches. All of these solutions were designed with an eye to showing residents how simply they could be done onsite, Nicolson explained. Every component was sourced from a hardware store. 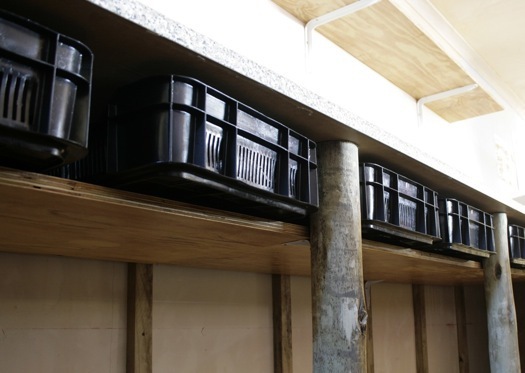 In the clubhouse, plastic crates were used for drawers, while in the changing room, wooden-lidded buckets doubled as seats and storage facilities. A rope strung with wooden blocks provides a helmet-hanging solution that does not put too much strain on the structurally weak dry walls. An outdoor misting system was made from a standard-issue hose pipe. As a finishing touch, Thingking used milk cartons and cable ties to create windmills to adorn the surrounding fence. 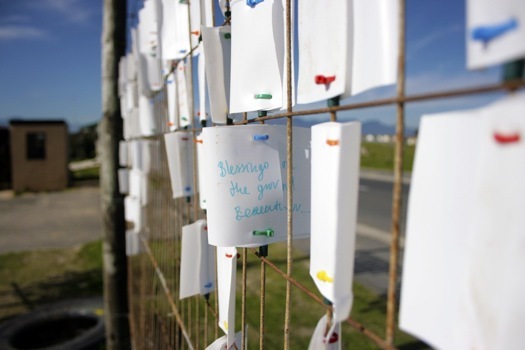 Community members write wishes on the plastic “wings,” which are then attached to the fence and blow in the wind. One such wish is already coming true: the 12-year-old Anita Zenani will be participating in the BMX World Championships in Denmark at the end of July. The first time a Velokhaya team member has been seeded internationally, this will be only the second time Zenani has been outside of Cape Town, following her BMX World Championships debut last year in Pietermaritzburg, South Africa.